The Bobcats are the first four-time District 3 champs since the 1970s. Northeastern senior Jeff Reynolds sat on the floor behind the bleachers in Dallastown High School’s gym. The significance of Friday’s win hadn’t set in yet. The Bobcats had just swept York Suburban to win their fourth consecutive District 3 Class AA title, a feat that no team has been able to do since the 1970s and one that a Northeastern squad hasn’t done since the 60s. Reynolds was still taking in the moment of winning as he sat there, unable to fathom the bigger meaning behind it. “I think I’m going to look back probably in a couple weeks and really be astonished by what we have done over the past four years,” he said. Northeastern still has the state tournament to look forward to, where they’ll also be looking to win a fourth championship. But Friday’s district title was another sign of just how well the volleyball program has been run. The Bobcats' success hasn’t been limited to just the last four years. 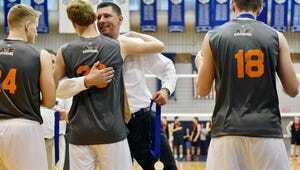 Northeastern won seven of the last eight district titles and have seen continued success under head coach Matt Wilson. Wilson wasn’t ready to start thinking about the legacy of the program just yet knowing there is still at least one more game to play — if not more — this season. And what’s ahead could very well be another game against York Suburban. The current setup of the state bracket could create semifinals matchup against the YAIAA rivals, but that’s only if everything goes right for both teams. Back behind the bleachers as the Bobcats celebrated, the seniors reflected on the journey they have been through together. Northeastern will graduate five seniors at end of the season. It's a group that has been close before they ever took the volleyball court. But as the core begins to change next season, Wilson is confident in the players coming up. “I think we’ve got a group next year that’s in a really good spot to really step in there,” Wilson said. “I think they have a true desire to want to keep (the success) going."